The carving of utensils for use in the kitchen and elsewhere was a common practice before the arrival of stainless steel and plastics. In Wales during the 17th and 18th centuries agriculture was the most important industry and way of life, and the long winter months meant that young men had far less work on their hands. The winter months were also the time of social gatherings during the evenings for social celebrations of singing and poetry reading etc, known as Nosweithiau Llawen. Social life centred largely around the chapels and was largely in the Welsh language with many communities being monolingual. News 02/15/2018: Americans fall in Love with Welsh Spoons. 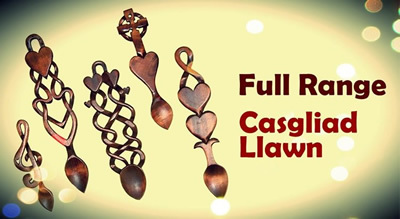 Click to view the full range of Welsh Love Spoons. In these Welsh communities there was also great poverty, and young men who wanted to impress their girlfriends would spend hours during the winter carving spoons with intricate designs to give as gifts. These spoons came to be known as Love Spoons and it is a centuries old tradition in Wales. They would mostly be carved from one piece of wood and would include symbols of love such as hearts, Celtic knotwork, balls in a cage, bells and horseshoes intricately carved to create beautiful and lasting gifts. These days the Welsh Love Spoon tradition is enjoying a revival and is quickly spreading around the world as people strive to find unique and treasured gifts to celebrate and commemorate Special Occasions. Because of the strong historical connections between Wales and the USA, Welsh Love Spoons are now extremely popular as Wedding and Anniversary gifts in America. We only charge £5 to ship our hand carved lovespoons worldwide, and as the US Dollar is currently stronger than ever against the GB Pound, Welsh Love Spoons are now more affordable than ever for customers in the US. The Welsh were among the first to settle in the USA and have since made a significant contribution to life in North America. In the USA today, over ten million people have Welsh last names. Welsh people looking for cultural and religious freedom from English dominance were among the first to establish colonies in America. In 1662, Jon Miles led Welsh Baptists to Massachusetts where they established the town of Swansea. In 1682 Welsh Quakers settled in Merion, PA. In 1764 Morgan Edwards of Pontypool established Brown University in Providence, RI. In 1757 Morgan Edwards became President of the College of New Jersey now Princeton University. In 1849, after the discovery of gold in California by James Marshall, thousands of Welsh people with mining in their blood joined the ‘Gold Rush’. In the 1840’s and 50’s thousands of Welsh Mormons emigrated to America travelling west to join Brigham young in Utah. Today it is estimated that 20% of the population of Utah is of Welsh descent. Welsh Americans are an American ethnic group whose ancestry originates wholly or partly in Wales. In the 2008 U.S. Census community survey, an estimated 1.98 million Americans had Welsh ancestry. 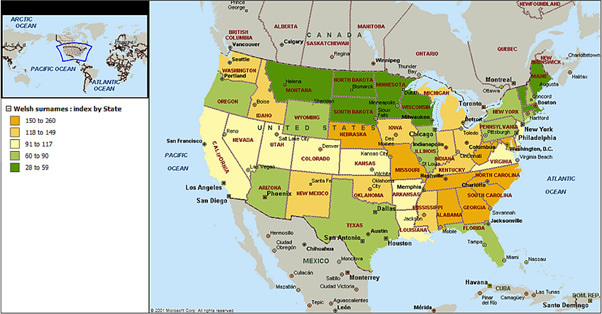 The geographical pattern of the Welsh in the United States is a reflection in part of the era of maximum Welsh emigration, which was earlier than that of the Irish, continental Europeans, Hispanics and Asians. It may well be that the concentration of Welsh names in Appalachia is explained by the importance of coal mining to that region’s economy. Links between the USA and Wales are lengthier and far more considerable than many people know. For example, five of the first six Presidents of the USA were of Welsh descent and the country has had no fewer than ten Welsh-connected Presidents in all - plus, briefly, the President of the Confederate States of America. The Welshmen at the helm of the most powerful country in the world were:- John Adams, John Quincy Adams, Thomas Jefferson, James Morrison Jnr, James Monroe, William Harrison, Abraham Lincoln, Benjamin Harrison, James A Garfield and Calvin Coolidge. The Confederate President was, of course, Jefferson Davis. Did a Welsh Prince ‘discover’ America? Whilst it was generally believed that Columbus was the first European to discover America in 1492, according to Welsh legend, that man was Prince Madog ab Owain Gwynedd. A Welsh poem of the 15th century tells how Prince Madoc sailed away in 10 ships and discovered America in the 12th century. Madog, the illegitimate child of the King of Gwynedd, was born at Dolwyddelan Castle in the Lledr valley between Betws-y-Coed and Blaenau Ffestiniog. In 1170 Madog sailed west from Aber-Kerrik-Gwynan on the north Wales coast and is said to have landed in what is now Alabama in the USA. Prince Madog then returned to Wales with great tales of his adventures and persuaded others to return to America with him. They sailed from Lundy Island in 1171, but were never heard of again. Early explorers and pioneers found evidence of possible Welsh influence among the native tribes of America along the Tennessee and Missouri Rivers. In the 18th century one local tribe was discovered that seemed different to all the others that had been encountered before. Called the Mandans this tribe were described as white men with forts, towns and permanent villages laid out in streets and squares. They claimed ancestry with the Welsh and spoke a language remarkably similar to it. In 1953 a plaque was placed alongside Mobile Bay by the Daughters of the American Revolution. "In memory of Prince Madog," the inscription reads, "a Welsh explorer who landed on the shores of Mobile Bay in 1170 and left behind, with the Indians, the Welsh language." There are several Welsh societies for people of Welsh decent, or people who are interested in Wales in the United States. People join many reasons. Some want to honour their Welsh ancestry. Some aim to learn or improve their command of the Welsh language. Some are excited by the vibrancy of contemporary Welsh culture – literary, music, fine arts – in film, books, shows, exhibits and performances. Others like to cheer on Welsh success in sport and competition. [LIST] Welsh and Welsh-American businesses, shops, pubs, wineries, churches, societies. [MAP] Communities and Societies for Welsh Culture in the United States.